Pokeweed Poisoning is the accidental or intentional intake of the plant or plant product containing the compound. All parts of this plant are poisonous, but most of the toxicity is confined to its roots. What are the Causes of Pokeweed Poisoning? What are the Signs and Symptoms of Pokeweed Poisoning? The signs and symptoms of Pokeweed Poisoning can vary from one individual to another. It may be mild in some and severe in others. Several systems of the body may be affected. In most cases, the symptoms may be seen within a few hours (up to 6 hours) of eating the plant product. How is First Aid administered for Pokeweed Poisoning? Who should administer First Aid for Pokeweed Poisoning? 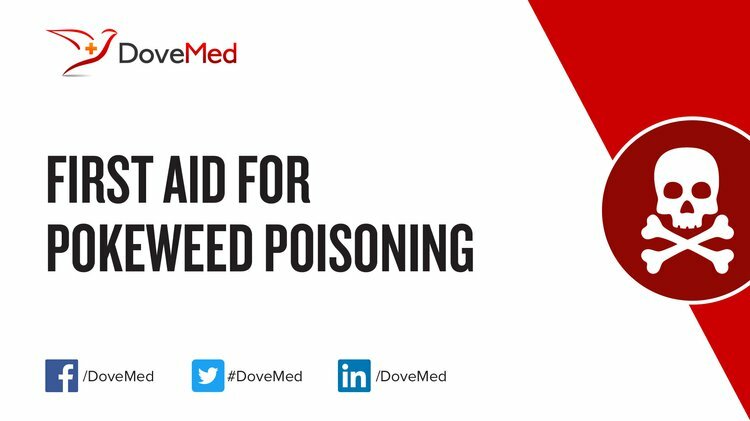 First aid for Pokeweed Poisoning is administered by healthcare professionals. What is the Prognosis of Pokeweed Poisoning? How can Pokeweed Poisoning be Prevented? Jeong, D. K., Moon, H. J., Lee, J. W., Park, S. H., Lee, H. J., Seol, S. W., ... & Kim, J. W. (2012). Clinical Features of Pokeweed Intoxication Experienced in a University Hospital. Journal of the Korean Society of Clinical Toxicology, 10(2), 86-90. Bronstein, A. C., Spyker, D. A., Cantilena, L. R., Green, J. L., Rumack, B. H., & Dart, R. C. (2011). 2010 annual report of the American Association of Poison Control Centers’ National Poison data system (NPDS): 28th annual report. Clinical Toxicology, 49(10), 910-941. Valle, E., Vergnano, D., & Nebbia, C. (2016). Suspected Pokeweed (Phytolacca americanal.) Poisoning as the Cause of Progressive Cachexia in a Shetland Pony. Journal of Equine Veterinary Science, 42, 82-87. Petersen, D. D. (2011). Common plant toxicology: A comparison of national and Southwest Ohio data trends on plant poisonings in the 21st century. Toxicology and applied pharmacology, 254(2), 148-153. Rahman, M. M., Abdullah, R. B., & Wan Khadijah, W. E. (2013). A review of oxalate poisoning in domestic animals: tolerance and performance aspects. Journal of animal physiology and animal nutrition, 97(4), 605-614. Kauffman, J. (2017). Practice for Outside Situations, and: Uncalled-for. Cream City Review, 41(1), 74-75. Chenchen, W., Wenlong, W., Xiaoxue, L., Feng, M., Dandan, C., Xiaowen, Y., ... & Baoyu, Z. (2014). Pathogenesis and preventive treatment for animal disease due to locoweed poisoning. Environmental toxicology and pharmacology, 37(1), 336-347. Davanzo, F., Miaglia, S., Perego, S., Assisi, F., Bissoli, M., Borghini, R., ... & Ferruzzi, M. (2011). Plant poisoning: increasing relevance, a problem of public health and education. North-western Italy, Piedmont region. J Pharm Sci Res, 3(7), 1338-1343.